Leading Indicator of big trouble, now fermenting in the banks. 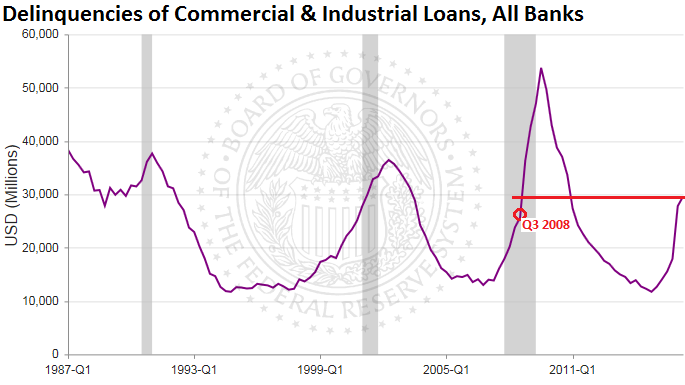 This afternoon, somewhat obscured by the Fed’s media-savvy and endless flip-flopping about rate hikes, the Board of Governors of the Federal Reserve released its second quarter delinquencies and charge-off data for all commercial banks. It shows that if the Fed wanted to raise rates before serious signs of trouble emerged, it might have missed the train. Wow! 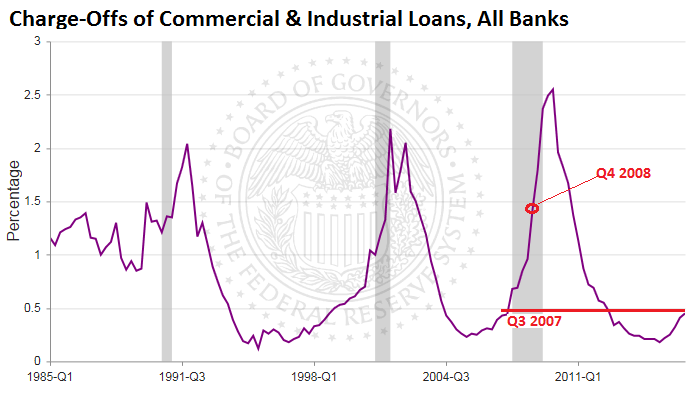 To think the US has passed through 5 years of 5% unemployment ( officially ) record car sales, record commercial and residential real estate prices, record stock prices, and the Fed has made just a quarter point to windward as we now have to try to tack past the rocks. It looks like its going to hit the fan again and there is no dry powder. So much for reloading between skirmishes. Well, orthodox-ists has learned the art of not admitting recession at any cost is the best way to avert one. You clearly still believe that an activist monetary policy has some connection with the real economy. After twenty years of Japan and almost ten years of the Fed I have disabused myself of that notion. I would prefer that the Fed has no opportunity of “reloading.” Three massive bubbles (2000, 2008, now) is three much in a short time. Spontaneous combustion is the new strategy. Although, they have unconventional tools at their disposal. Self immolation is their unconventional, disposable tool. The odds of the cynic are against the charge-off rate reaching escape velocity. What’s to stop the Fed from buying the delinquent loans? The only a question is how. I’m betting on a Wolf to catch it before a fox. The banks charge off the bad loans and then sell them to collection agencies who become the new creditors. This is the same thing that happened during the financial crisis in 2008. They might even tell the delinquent customer they have written off the loan and will not be pursuing repayment, while forgetting to mention they sold the loan to a another firm who will. debt jubilee!! weeeeeeeeee…ahem…uh…I mean…restructuring and making investors whole. very serious stuff. seriously, if debt jubilles were good for medeval times, theyre good now. we need to get a clue, and by we, i mean the elites. get a clue people! smh. The only Private citicen recipients, of any form of “debt jubilee” will first be bankrupted, by a collector somewhere in the system. Day after day … year after year… the pundits tell me that the central bankers are stupid/insane/corrupt/evil and son on…. If the central banks destroy the engine — they destroy themselves. Bill Gross gets it. A 10 year old could be made to understand the implications of central bank policy. Let’s assume the central bankers understand that they are committing suicide. Now what do they fear that has driven them to blow up the system that is the foundation of their power? Blowing themselves up is how Wall St. works. These guys have no boundaries and no limits. That’s how Bear Stearns and Lehman went under. P.S. This is the result of investment firms going public. When the big Wall St. firms were investing their own money, in partnerships, this rarely happened. I think it is more a matter of Group Think along with total faith in the Power of Positive Thinking.. In most organizations, with every layer of management and bureaucracy about half the common sense and knowledge is lost. The PPT faith will not allow anyone to say “Wait! What IF!” If you do not go along with the *common* knowledge and go out on a limb, some one will cut that limb off because you no longer think like the *group*. The only way to survive is to go along to get along. Just think how many layers of management/bureaucracy there are between the street and those who make the rules! Those at the top actually understand very little of the real economy but can not give the slightest appearance of doubt. Any thought that the FED actually understands anything relevant is just plain magical thinking.. The central banks understand this is guaranteed to blow up the system — to wreck the global economy. They absolutely do not believe it is going to fix anything. Why blow up the system? Thomas, you really think that while this train is running full steam ahead off the broken bridge into the chasm, the FED wants to add more and more cars to the train so that when it goes, it will kill more and more people? As I have explained we are out of cheap to extract oil. If they Fed did not act after the turn of the century the train would be off the tracks already and smashed into pieces. The Fed’s current actions will eventually push on a string and the train will fly off the tracks and smash to pieces. The result will be the same — would you prefer it to happen sooner than later? The stark reality is that we are out of cheap oil. When the end comes it will be total. It will be forever. Remember this – over 99% of all agricultural land is farmed with petrochemical fertilizers and pesticides. When they are no longer available i.e. post collapse …. 7.3 billion people will starve. But it gets worse…. there are also 4000 spent nuclear fuel ponds that will run out of control when the economy collapses. The problem is if the spent fuel gets too close, they will produce a fission reaction and explode with a force much larger than any fission bomb given the total amount of fuel on the site. All the fuel in all the reactors and all the storage pools at this site (1760 tons of Uranium per slide #4) would be consumed in such a mega-explosion. The Fed is literally fighting to delay the extinction of our species. Perhaps now you might understand why they are doing things that make you want to pull your hair out. Whatever it takes — to hold back the beast for as long as possible…. I guess that one definition of insanity is to do something over and over always expecting different results! The FED is either insane, cruel and demented or so involved in Group Think that they can not see the forest for the trees.. which is my best guess. I agree. desperation. They’ve backed themselves into a corner just like the Italian banks doom loop scenario where the ECB has no choice but to bail out the banking system or it’s lights out on the whole thing. They are stuck. And they know it. Plain and simple. Thomas, I know what you are saying is a fair assessment of the future. What frustrates me the most is that what you are saying is a Group Think Committee analyzation of it. Because it is said, it must be true. So the collective belief is that it is “True”. WE will only study and plan for the scenario that benefits those of us who rule! Mankind does seem to be headed toward a massive die off. Not that we have to. EXCEPT the corporate, religious and government mindset is set on never ending growth. Which can not happen on a planet. There is a carrying capacity. You mentioned peak cheap oil. Oil is still the most prominent energy source. The *efficient* farming practices require lots of energy and water and one is at peak, near peak, beyond peak? There are issues with the current practice using GMOs and lots of chemicals and lots of energy to produce enough and distribute enough to keep people from becoming restless and agitated. Personally I think we have exceeded it already.. And rather than cut back on producing more and more people, the Collective Group Think Committees continues to push toward more and more growth. To pay over and over, not only for what we have previously built but for what we are consuming.. The world is truly on an Insanity Train ride. YET! This is about credits on one side or the other of the big ledger in the sky. Who works and who benefits. AND rather than spend the time and money to at least plan to do something about making a corner and hope the speed of the train isn’t such that we just roll into a ravine. No, there is no room for alliterating the path.. they (we) have to go off the broken bridge? Where are our survival instincts? And IF any of us underlings, even if ALL the underlings scream their lungs out to the power struggles at the top. Well, there really is no longer any connection between the masses trying to have a good life and raise their kids and those who now rule them. There is no / zero connection… All those getting laid at the party are way to busy trying to extract their *due*. This is how the top of our economic/political system is functioning! You know it and many people know it. Rome! If you’ve ever studied that crazy system, worked until the cost of getting the energy (fuel/trees) to their huge cities and factories was just to great. Then as now, those with power fight change tooth and nail and the system just stagnates and then ….. You are probably correct. Humans love their beliefs… They’ll fight wars over them and stick to them to the end.. even when they are dumb and harmful and even suicidal. Group ThinkEconomics / Politics has *given! * a majority of us in the US, absolutely NO one to vote for that is not a disciple of that Insanity Growth Forever Doctrine… The people are restless and very agitated. Maybe this will be the election of the Green Party or the Libertarians? All I can do is hope and just enjoy what time I have. When people feel they have no choices and they feel their way of life is threatened…. desperate mobs … And all because the rulers were so disconnected to reality that they just couldn’t see the warning signs. To engaged in getting laid. I understand where you are coming from – I have been there. It is only relatively recently that I have come to these conclusions… previously I suspect you and I would have been pretty much lined up on these issues. The economy MUST grow…. if it fails to grow — and we fail to reverse that trend — we enter a deflationary death spiral. Job losses – fear — less spending — which leads to more job losses… which reduces consumption even further — more job losses…. Then the operating system of the economy – the financial system — would collapse. Or we can continue to do ‘whatever it takes’ and push collapse off into the future. Rubbish you can plan and controll a decline. People like you dont want that option, as you and they will not benefit from it. You and they benefit from the oil and credit fueled economic morass we are in. So you continuously promote more of the same as the only option. You are part of the problem naysaying any attempt at a solution. Yes, under the current paradigm it has to grow. BUT now it can not grow because of the physical constraints due to the fact that exponential growth in a finite system is not possible. The finite system is a constrained at this time by peaked out energy, global warming and peaked resources. We no longer have cheap plentiful oil supplies compared to the world’s population and demand. We can’t even recycle the physical resources because of the cost of the energy. We could however use the energy we have in a much more efficient manner but that would require a mind set other than Crony Capitalism and Narcissistic leadership. Thus the dilemma of disconnected Group Think by our power structure and their belief in their own Power of Positive Thinking. Again, there is always hope that a new paradigm will emerge and not as a phoenix from the ashes of destruction. Our entire system is built on cheap energy and energy is no longer cheap and we won’t admit it to ourselves. The age of the individual is over and the age of self preservation of our civilization is upon us. We either rise to the occasion or we kill ourselves off in endless skirmishes over who wins the final Monopoly Game. In addition to outstanding analysis of the situation — there are a core group of commentators who post deep insights. Many of those people are on Finite World. In other good news, Vancouver’s housing bubble just imploded. Prices down 25% in 3 months and 20% in one month. Delinquencies are new loan arrears. So if a company took out a loan 5 years ago, but now cannot make the loan payments and falls behind more than 30 days in making a payment, the bank considers the loan “delinquent” in its data. The Fed (one of the bank regulators) tracks this info and publishes the results. If a loan is 90 days delinquent, it means the company is three monthly payments behind. Just like a consumer auto loan. What I didn’t cover in the article is that banks set up “loan loss reserves” where they estimate how much money they will lose on these loans, and they book those losses in advance via these reserves. So the charge offs are against these reserves (which have already been expensed on the income statement). Be it Europe, Russia, China or the US, it seems business and governments have reached levels of debt that are impossible to ever pay off. But clearly the hope is that the world economy will become super charged and become able to pay off the debt with the future proceeds. Without either population growth and/or productivity increases economic growth is impossible. This seems to foretell flat or declining economic activities for the foreseeable future. It’s either more of the same for the God’s knows how long or blowing the whole thing up and starting over (War) which is a time honored mechanism for redistributing assets. Is there a third alternative? What happens next? Any ideas? Am I wrong? There is no alternative, sorry. Seems some are speculating on some kind of tech-boom/bioengineering revolution or something? Meanwhile the lying FED wears their Farnsworth Electronium Hats (a product of their forward time machine) harnessing the power of sunspots to produce cognitive radiation. “Productivity increases are unlikely”? Please don’t be a negative nancy, I at least anticipate several exciting developments, one of which will come from robotics. After all we have all the parts for it already: the hardware to move and manipulate, the camera eyes to see and the cheap chips to think. All that’s needed is a bit of software, an area where science is making great strides. It could usher in an era of free money, human emancipation, local manufacturing and who knows what else. The future is bright (if the bots don’t kill us). robotics, really? an era of free money, human emancipation? Just another “Fundy”. Fundamental that is. To add to the ever growing litany of negative fundamentals. There are many, many more fundamentals just as equally bad. This cannot be fixed with just a monetary policy change. This system has now gone well beyond being fixable. It is now irreparable and requires a system wide reset, or a completely new system. Yet somehow “They” (subjective term) are able to lull the masses and suppress cognitive thought. Is there available a picture or a simple diagram of the sprunjer. I would like to procure one for personal (non-commercial) use. I would too! See “Bender’s Big Score” for a full explanation of how these alien scammers were able to use their spunjers to uncover a Paradox-Free Time Travel Machine, which they use to swindle all of Earth’s wealth, much like the FED has enabled TBTF criminal enterprise in the largest transfer of wealth in human history. you forgot the damage to the ecosystem that is lowering the amount of food this planet is producing. Floods, fires, and great pestilence is already here.. There is just NO way that the planet can become MORE productive and make more profits to pay off the astronomical debts that have been created while making more food and things most people really don’t need while not adding to the global weather, environmental disasters that we are already seeing. It will take decades at least for the seas to recover. Wiping out the debts will reset everything and allow humans and the remaining infrastructure to be returned to productive use. But between the weather gods and angry people, what remains will be much less than we have now.. I just can’t see any way enough growth to return to pay off the huge volumes of debts and obligations now on the books..
And by definition (excluding perhaps technological advances) increased food production equates to additional habitat destruction, no? 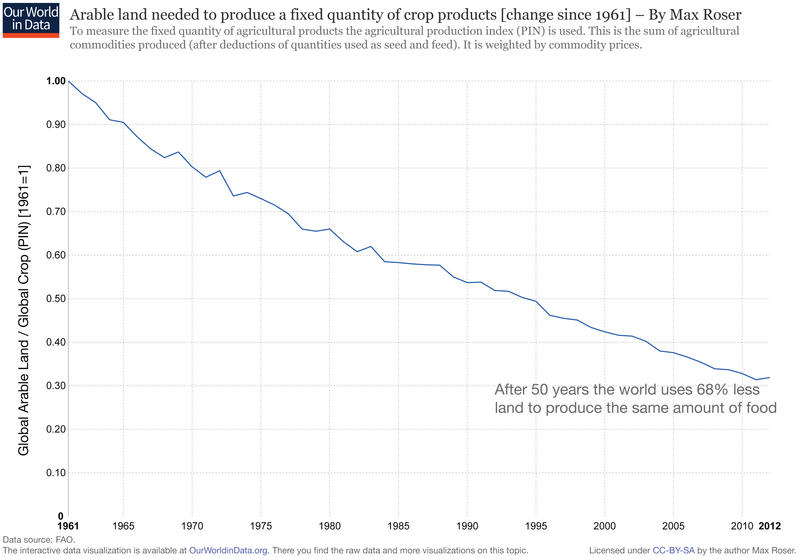 I did find another chart that said this: “After 50 years, the world uses 68% less land to produce the same amount of food.” From 1961 to 2012. It includes data on countries whose production methods have not changed much over those 50 years. So I think in the US, farm productivity has increased more than that. This doesn’t answer your “habitat destruction” question, but it gets us a step closer. Agriculture is 1st on this list, inclusive of agricultural biofuel production. Seat belts, Folks! Keep the neck from snapping when the head impacts the overhead luggage rack. This is [possibly just] the “END of the [unwind] Beginning”. The majority of the adults to experience the Great Depression have already checked out so, not a lot of “oral historians” remaining to give One a glimpse in to the daily “adjustments/challenges” of the GreatER Depression, that commenced 2007-08 and gathering momentum. It’s all “a PROCESS” . . . UNTIL IT ISN’T! Exciting times . . . for the [prepared/rural berthed] repenting Remnant! Ooooops! Censored AGAIN. The moderator is exposed. Your comments are blocked when they get into war mongering – particularly your favorite, World War III mongering – as the solution to the credit cycle. I can stand plenty of silliness, and I produce some of it myself. But I can’t stand war mongering. And suggesting war as a solution to the credit cycle exceeds my tolerance. I agree with the general premise that TPTB will lead us into a world war to reset the monetary system. All you have to do is look at the Paris conference of 1919 and the Dawes Plan that followed. Then Bretton Woods after WWII. It worked the last two times. Anyone can believe anything they choose to believe. But what they can post on WS is more limited. I’ve studied WWII quite a bit, frankly more than some tenured profs teaching the period and have a few bits published. It would be very hard to find ANY historian who thinks you can separate Hitler from WWII. If he isn’t around it doesn’t happen. Up until Hitler the Army had been the main decider about war. The Kaiser Wilhelm II was afraid he might be overthrown by the Army if he ‘fell out’ -backed down in the run up to WWI. After defeat the Army was fearful of another war, but Hitler relished the prospect. In the pursuit of power, Hitler courted the Army- once he achieved it things changed. He alone faced down the Army when he re-occupied the Rhineland. They also tried to convince him that Britain’s guarantee to Poland was not a bluff, and that a German invasion would provoke the war. On Sunday, November 5, 1939, a month after the outbreak of the war but before the attack in the West, General von Brauchitsch sought an interview with Hitler. After some uncomfortable preamble, the General said the Army would be grateful for an assurance that the Army alone would be responsible for future campaigns. For the next few years the Army swarmed with plots to get rid of Hitler and end the war. On a visit to the Russian front it was planned to arrest him- but he brought a big SS contingent that arrived first. In 1943 a bomb was placed on his plane but didn’t detonate. In July 1944 in the last attempt ( Valkyrie) the bomb did go off put unfortunately Hitler survived. About 2000 or so of the conspirators didn’t. Many who weren’t executed committed suicide. The hero of the Afrika Korps, Rommel, respected in the West as a clean fighter and charged with the task of approaching the West for a peace, chose suicide and a promise of safety for his family over trial. Any attempt to separate Hitler personally from the war (from which only the US emerged intact although it certainly wasn’t their idea) and assign the blame to the usual occult financial motives faces a very uphill struggle. And of course it was a key plank of the National Socialist German Workers Party that finance ( i.e, the Jews) had started WWI. Yes it is an inhuman suggestion. It is however something China is playing at. There can be no other explanation for there behaviors in the Western Philippine Sea. The only question being does it remain an Asian war or globalize. The Versailles Diktat guaranteed another major war in Europe, (which morphed into WW II, due to American isolationism). No matter who lead Germany. Your failure to comprehend this BASIC of 20 Th Century European Military and political events is astounding. Given your claim’s. Agreed that Versailles was too harsh and by 1930 ish most Brits agreed. This lead to what today is called the ‘appeasement’ of Germany. Unfortunately for everyone, Hitler got the credit. By September !939 Germany had re-armed, gobbled up Czechoslovakia, and annexed Austria, leaving the Reich with a greater land mass than BEFORE WWI. It is well established history that the German Army disagreed with Hitler ( and you) and wanted to stop at this point. There are some excellent references, and good facts in that book, Which will direct the reader to other good works, some of which are not prominent. However it is far to PRO KENYSIAN Biased. To be of any real use. So the market is 2T and we are worried about approx. 1% being delinquent? Or is just the pace?